As Neil Young's 2017 sabbatical continues, we're taking the opportunity here at Thrasher's Wheat to dig out from the TW Archives some old posts or posts that we never quite got around to publishing. Enjoy! "Silver & Gold" was released in April 2000. The cover shot for this album was taken by Neil's daughter Amber on a Nintendo Game Boy Camera. Good To See You – "I wrote this on the back of the bus, early on in the tour. All I had was the line 'Good to see you,' and I thought, 'Well, what good is that?' But it said what needed to be said. It's about coming home after being gone a long time." Silver & Gold – "This one says to me that relationships are more important than material things. You could take a look at me and say I was really full of it, because I have so many possessions it's ridiculous. But it's dawning on me how useless most of them are." Daddy Went Walkin' - "It's got my father in it, but I think it's about everybody's father, everybody's parents. It's like taking a look at these old folks who have lost their mates, or who've gotten a divorce years ago, like my parents. And it's about kids hoping that their parents will get back together again. It's a hope all kids in that situation have, I think." Buffalo Springfield Again – "What's cool about CSN&Y is it gives Stephen and me a chance to play around with what we were doing back then and take it to another level. When he came up to the ranch to work on the box set, part of it was kind of depressing in the end because I think we both felt like it had all been cut short. We realized how much more there was for us to do." The Great Divide – "This is a good example of a song that you can't just break out when you're sitting around with a bunch of friends having a good time. You have to have exactly the right people and the right situation. Fortunately I did. Ben Keith plays steel on that one and Oscar Butterworth did a great job on drums." Horseshoe Man – "He's the one we can all count on, the one who makes things interesting. He fixes broken hearts by taking the pieces and throwing them up and down. He shakes things up." Red Sun – "I wrote this song on a really fresh day. My head was feeling good and I was really open. I remember I was by myself when I did it and, by the end, I was crying. It was very emotional. I kept hearing Emmylou Harris' voice on it and I finally ended up taking it to Tucson to Linda Ronstadt's house, where she and Emmylou were working on an album with Dolly Parton. They ended up singing on a lot of the songs on this album, but this one really got to me. The song's got a little bit of religion in it and Emmylou's voice, especially, is suited to that." Distant Camera – "There was one thing I let go on this album. It's on this song and it still bothers me. There was a misplaced beat and nobody liked it but me and I wanted to leave it in because that's just the way it had happened originally. But I took it out and to this day, whenever I hear this song I think about that kick drum. And I probably always will. That's just the way my mind works." Razor Love – "It cuts clean through. It's the kind of love that cuts clean through everything." 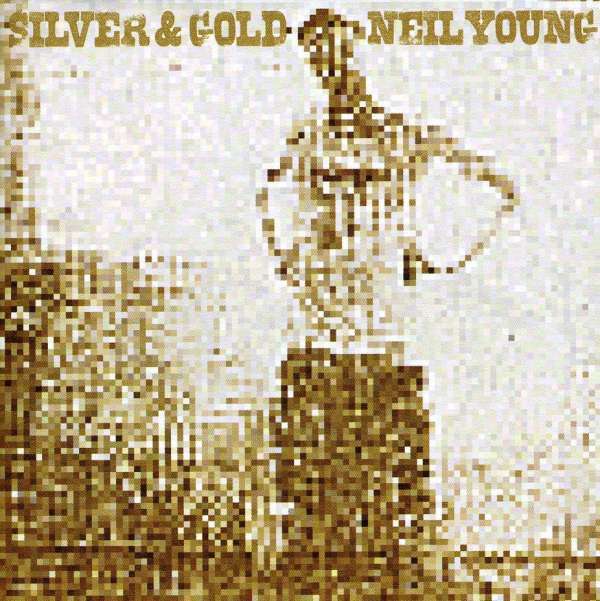 For more on Silver And Gold by Neil Young, see Albums In Order Review Series by Mike "Expecting 2 Fly" Cordova. Without Rings - "This is one of the first songs I recorded, back when I thought I was doing an acoustic solo album. It's another one I wrote in the back of the bus, somewhere in Florida at some weird amusement park in the middle of the Everglades. I had this big piece of newspaper with felt tip marker writing all over it. It's kind of like 'Mr. Soul,' inasmuch as it was written on a piece of newspaper with a felt tip marker and it all came out in one long line and then it was done." The best version of Silver and Gold is the one cut with CSNY in the mid-eighties. In the key of G.
SILVER & GOLD is one of Neil's best albums & superior to the similar PRAIRIE WIND, imo. I've heard Neil talk about his writing process before, but can someone who might know explain: does he just write indiscriminately on newspaper with thick marker lettering or is he sticking to the margins? Seem to remember that it was suggested that some of the Neil tracks that ended up on CSNY "Looking Forward" were originally intended for "Silver and Gold". Ian is right, there are 3 tracks on Looking Forward that have the same band as the Silver and Gold band and I think were recorded at the same sessions but with backing vocals added by CSN. Its not the same band who contribute to the CSN tracks on Looking Forward. They are not CSNY tracks although the backing vocals on slowpoke and Looking Forward by Nash and Crosby make a great contribution. I imagine at the time Neil just emailed them the tracks and said use these for your CSNY album. I think if you combine slowpoke, Looking Forward and Out of Control to Silver and Gold you have arguably Neil's best solo acoustic album. The DVD of Silver and Gold is my favorite Neil Young DVD. He is just at the top of his game, his songwriting, his voice and guitar play are just untouchable. At the time reviews for Silver and Gold were luke warm. It shows just how good he was through the 90's that when Silver and Gold landed it did not receive a huge fanfare and was perceived as somewhat his normal standard. Imagine if he released something of that standard now. Listening back you can really appreciate how good he was and how he managed to remain so good well into his 50's. In that period his songs seemed so focused on love, family, friendship and the vulnerabilities of life. The past 10 years he has struggled to capture that as succinctly as he once did. Also, I think its very rare that Neil gets both the songs and the production perfectly aligned as he does on Silver and Gold. He did this throughout the 70's and then hit the groove again of synchronizing good songs with complimentary production in the 90's. Since say 2009's Fork in the Road he has struggled to get in flow with complimentary production. He has tried different things in the studio i.e. Le Noise, Storytone, A Letter Home and Earth which have not somewhat consistently complimented his songwriting prowess with supportive production. An example to give would be 'Walk with Me'. It is a brilliant song, one of his best. Listen to it done with Pearl Jam at the end of the Pearl Jam film but I think on Le Noise the absence of a rhythm section coupled with the use of echo chambers and distortion lets it down. When I listen to it I find myself turning it down as opposed to turning it up. I love this album. I think it's very underrated. All the songs in it are very good or great. It's an old fashioned record - solid songs if unspectacular - Looking Forward was a sorry mess not helped by some very poor songs from all quarters. @Giles Mac, I fully agree that the Silver and Gold DVD is a highlight of the Neil Young acoustic catalogue. In fact thank you for reminding me about it, I'm going to go home and watch it tonight. If I'm not mistaken there is a version of 'Long May You Run' on pump organ on that one which is a nice Neil twist. I do enjoy the 'Road Rock' DVD, it's a different band and different presentation and allows him to do some songs that might be unattainable solo acoustic but for top to bottom viewing (and listening) 'Silver and Gold DVD' is a highlight of the time period. With respect to 'Looking Forward' I love the song, but agree that the album and the version of the song on the album is a bit of a letdown (although that version beat out every other song my wife and I know to be the first dance at our wedding, so it was a CSNY letdown that still passed above a pretty high bar). I saw the CSNY2K tour to support that album in Toronto and all four of them were excellent - they made the 'Looking Forward' stuff sound great live and rocked out and played 'the wooden stuff' incredibly. Although I would consider myself a Crazy Horse and then everything else Neil fan, the CSNY2K show is certainly a highlight from a number of NY shows which when combined in cost to attend would allow me to own my house by now had I not gone to see them. Oh well, what's life if you don't live it right? I don't necessarily think that Sliver And Gold is Neil at the very top of his game (bearing in mind that some of the best songwriting on it is sourced from the eighties). But then again, he's still got plenty in the tank; he's still got a magical turn of phrase, that unique way of combining words and imagery into more than the sum of their parts. It's something that has been absent in many of the albums since; and it basically comes down to lack of practise, getting a bit lazy and settling for the first few unimaginative verses; because there's been no real incentive to do otherwise, no David Briggs prodding him to go deeper. It's a challenge to maintain any skill for decades on end. On Silver And Gold, Neil was still riding the wave of his late eighties/early nineties resurgence, and he was still in the zone as a songwriter. Which is basically what the sucess of a Neil Young album hangs on. Mick is right; Sliver And Gold IS superior to Prarie Wind. Because the songwriting is better. It sounds like an old master at work, rather than a moderately-talented amateur with a professional band. Why have you not listened to Prarie Wind or Fork In The Road all that much recently? Because the songs simply aren't very engaging (on the whole). They are the work of an artist resting on his reputation, giving him a ticket to pass off half-strength works as the real deal. Perhaps it's not his best album, (all things considered) but at least, no such complaints can be made about Silver And Gold. Giles: I agree with the general thrust of your comment. But is Walk With Me really "one of his best"? Lyrically it barely scratches the surface; lines like "I'll never let you down no matter what you do/If you just walk with me and let me walk with you" aren't exactly going to give Cortez The Killer or Will To Love any lost sleep. Nobody would consider this "good songwriting" if anyone other than Neil Young had written it. Like practically all of Le Noise, it strikes me as being a case of artless and shallow songwriting dressed up with over-the-top production. Practically the definition of "style over content". I don't really have strong opinions about Lanois' work (postive or negative), but he does need good songs to work with. I'd say that Don't Take Your Love Away From Me is a good example of a far more imaginative and thrilling song in the same ballpark (thematically). I listen to Silver and Gold and Prairie Wind several times a year, and feel each one is remarkable in reflecting where Neil was at the time. I'm not sure comparing the two records is fair, as he was deeply immersed in two very different periods in his life. I feel each record Neil releases reflects his state of mind at that time as he journeys through his life, and as @Tom mentioned in his last post, "What's life if you don't live, it right?". Prairie Wind reflects a moment in his life that carries a theme directly relating to his father, and of a most intimate and personal loss. When I listen to that record I feel Neil is so honest in his lyrics that I sometimes feel I'm invading his private space, and exposing his deep and personal feelings creates a moving experience for me. When my father passed this record helped me through the mourning process, and for that I am grateful. I do agree that Silver and Gold is a high water mark in Neil's cannon and that lyrically it is more artistically crafted. So simple. And yet it capture so much, and works on more than one level. It's like a 3D image, wide and deep. A beautiful combination of words and sounds. Meaningful without pretension. What did he hear? What was the picture that changed everything? Change your mind about what? You can run with it. He makes you feel something without you having any idea where it's coming from! He makes your imagination the star of the show. That's the genius of it. It's kind of like having a dream that someone else is writing for you. It's the kind of lyric writing anyone thinks they can do; because it's so minimalistic. Until they try to do it, that is. In reality it's a rare skill that has to be built up and maintained, like any other. It once came easy to Neil, but only because he'd had so much practise and put so much dedication into it. I don't think Silver And Gold reaches these dizzy heights, but he's still coming from pretty much the same place. It works, it rewards the listener. Quite a few of the lyrics written since then (2002 onwards) have been a lot more one-dimensional and direct, which has never been Neil's strength. Kind of like junk-food that tastes good at first, but doesn't have much nutrition to it. It's not as fulfilling. That's my main reservation with much of Prarie Wind (though I agree with Dan Swan's take on it, as well - I do very much like parts of it). "Some of them seemed a little too simply descriptive for me, for Neil. But other ones, like the songs I mentioned, were great. But a couple of them, I don’t know...It’s like he just described a room or a situation and it wasn’t as magical as some of his other lyrics which make you think it could be your room or your situation. It was just too blatant of a description". Please, please, please don't put "Le Noise" in the same category as "Prairie Wind" or "Silver and Gold" all of which shine in time and space as masterpieces for different reasons. It's like comparing the "Pieta" to the "Sistine Chapel" to the Santa Maria degli Angeli. I love "Le Noise" and listen to it with headphones on drifting away to a safe place. It's an experience. It's a sound requiring listening skills for the electric reverb and sound waves. It's electric Copeland or Rimsky-Korsakov on fire. It's what would have happened if Scheherazade only had an electric guitar and amp. I produce the best art when I take "Le Noise" for a spin. I totally agree. Le Noise is one of the best experiments he's done. I understand Scotsman's criticism about the lyrics not being up there with the classics but, for me, that's not what it's about. I was listening to a recording of the Winnipeg show from the Le Noise tour the other day and I really enjoyed it but it is the oversaturation and blown out sound of the guitar that makes the album work. It's an expressionist painting made into an album (whereas something like Cortez is more like a piece of magical realism and Storytone is an amateur watercolour full of personal meaning but not something anyone but a relative would hang on their wall). Lanois didn't produce Modern Times. He did produce Time Out Of Mind, which Bob Dylan wasn't entirely pleased with and ultimately led to him self-producing all of his albums for the next 15 years (including Modern Times). Personally I like Dylan's albums with Lanois; the difference was that Dylan actually brought several decent songs to him, so he had something substantial to work with. Fun fact: the first two songs on Le Noise and the first 3 on Time Out Of Mind all start with songs or verses about walking. Oh man, I did write that, didn't I. Thanks for that correction, FScotzyman. I referenced "Time Out of Mind" just a few days ago here on TW when we were chatting about Jimmy McDonough's last interview with Neil. I've been listening to "Modern Times" a lot lately, too. It's neo expressionism like, a Jean-Michel Basquiat. @FScotzyman - After listening to Dylan and Neil since they broke into the business of writing songs and making music, I can really appreciate their volume of work over the years. I know it doesn't mean anything to them or maybe to you, but I get a warm fuzzy feeling when they're still getting nominated or winning Grammy Awards. Their work holds true today as it did yesterday. They're still here, still relevant, and still making good music. I hope Neil works with Lanois again. Razor Love and Without Rings are probably two of the most beautiful song NY has ever done in my opinion and they're both on the same 'so so' 'whatever' 'nice' album??? Truly unbelievable. Listen to them again. I love it when he sings low like that.